This is the third and final volume in Ben H. Winters' series featuring Hank Palace, the Last Policeman. 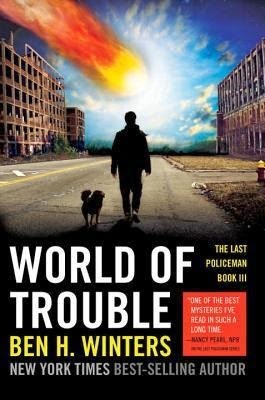 When the first volume, The Last Policeman, opened, Hank had just been promoted into his dream job of being a detective on the police force in Concord, New Hampshire. Sadly, though, the job is not going to last very long because in only six month's time, a giant asteroid is going to slam into the earth, ending Life As We Know It. The Last Policeman and Countdown City detailed Hank's activities for the first five and a half months of the asteroid's approach. As civilization rapidly unravels all around him, Hank works as diligently as he can to remain a decent and responsible man, continuing his investigations at a time when many, including not a few readers, might wonder if he has lost his senses. There are now two weeks left before impact. Food is scarce, potable water even more so. Things like the Internet, electricity, working phones, and gasoline are a dim, distant memory. Hank is reduced to traveling by bicycle and scrounging for food and water where he can find it. His last investigation is his most personal. His sister, Nico, is his last remaining relative, but the two have become estranged for reasons described in the first two books, and Nico has disappeared. Hank is desperate to find her so that they might spend their last few days on earth together. The search takes him to a small town in Ohio. In a world that has arrived at a post-apocalyptic state a few days ahead of schedule, hardly anything will surprise Hank or the reader, until Hank arrives in Ohio and discovers that things may have gotten even stranger than he could possibly have imagined. I thought that the second book in the series was a bit weak, especially when compared with the first, but Winters returns to form here and provides a very fitting conclusion to what was, overall, a very unique and entertaining series. The story itself is gripping and the larger questions that have hung over the entire series grow even more important here. Readers contemplating the matter might well decide that they would have chosen to spend their last few weeks on Earth is ways far different than Hank Palace, but hanging out with the guy for the last six months has been a helluva ride. Gotta love the old-school dash!